In 1980, we launched a brand-new nozzle called "Nozzle Five" with 5 watering patterns in Japanese market. Since then, we have been utilizing water for home improvement products, and providing people with comfort and convenience for gardening and car washing. Due to the customer-oriented new proposals and a wide variety of the products, we have become a top-share manufacturer in the Japanese watering product market. At Takagi, we are concerned about our customer's health and would like to see our customers using clean and purified water on a daily basis. This is why we created the industry-first "Built-in Water Purifier Faucet", called the "Mizu Kobo". Since its launch in 2000, its easy-to-use and environment-friendly functions have been evaluated in Japanese market, and the present market share for newly-constructed condominiums has achieved the rank 1st in the industry. Having the capability to manufacture dies & molds by ourselves, offers fast and flexible manufacturing of Takagi products. 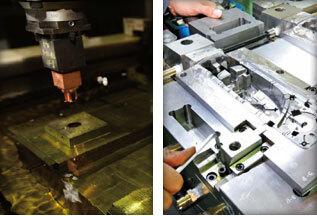 Takagi manufactures, repairs and maintains dies & molds to be used in plastic injection molding. In 1961, Takagi began manufacturing dies for plastic injection molding ahead of many other companies in Kyushu region of Japan and has already produced over 7,500 dies till now. The core of our manufacturing is based on our veteran engineers using precise process technologies to manufacture our dies & molds with ultimate precision.